North America. The Southern SB or Horned SB is a similar pest that attacks cucumber north to Delaware. Life cycle: This insect produces one generation each year. 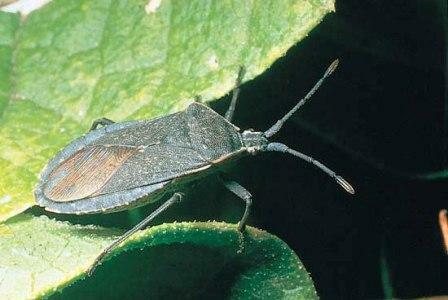 Physical Description: This 1/2 to 5/8 inch bug is a dingy brown to black with an orange or brown abdominal perimeter. It has a very disagreeable odor when crushed. The shiny gold-brown eggs are laid in clusters or singly on the underside of leaves and stems and are about 1/16 inches long. The nymph is a yellow/green with a dark abdomen and thorax. Feeding characteristics: This pest damages cucumber, melon, and pumpkin and squash plants. They can be found to eat in groups on leaves, inserting its needle-like mouthparts into the plant tissue and sucking the sap. It releases a toxin that causes wilting. Vine crops can easily be lost in the early part of the growing season. The leaves become wilted, crisp, and dark brown at the edges and later die. Controls: The Tachinid Flies (Trichopoda pennipes) is a natural enemy and can help control this bug. This pest can be repelled from squash and other susceptible plant by planting radishes, marigolds, Tansy, or nasturtiums close by your crop or garden. Remove vines and other garden rubbish after harvest. Try to plant next crop as far away from the last crop as possible. Hand pick eggs and insects off plants and dust with sabadilla if necessary.